Granted, there are some purposely challenging styles - the paperbag-waist minis, oversized waistcoats and cropped boxy jackets call to mind memories many Gen Xers would likely rather forget - but there are approachable options too if you're interested in updating your denim this season. At the high end of things, Stella McCartney has been campaigning for the return of acid wash for a couple of years now, and it looks like this is the year she's broken through. 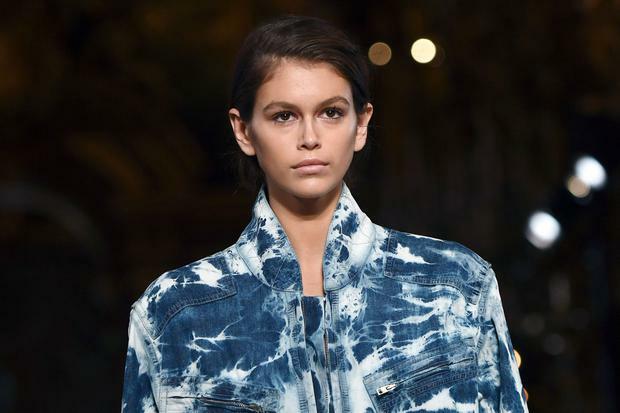 A bleached denim boiler suit sounds potentially disastrous, but on model of the moment Kaia Gerber, it looked effortless and elevated, worn with barely-there sandals for a polished finish. A V-neck top with matching jeans was similarly effective, lifting what we tend to think of as comfortable off-duty gear into a serious style statement. Acid-wash denim also made a starring appearance at Proenza Schouler in cool and very desirable A-line skirts, tiered dresses and even a tailored blazer. The effect was refreshingly modern: a palette of black, white, silver and pastels kept the looks low key, as muted tie-dye shirts and supersized tote bags brought an urban twist. The denim was decidedly 80s-inspired at Balmain and Isabel Marant. The mood was loud and nostalgic at the former, where a block of looks featuring high-waisted jeans and thigh-slit skirts were given a hard edge by metallic bodices and sharp-shouldered tops, while Marant opted for a softer take, pairing roomy denim shorts, jackets and jeans with pastel hues, glittering blouses and disco-ready sandals. It can be a hard sell for everyday, but with bleach-speckled denim making its way into the shops for spring-summer, you may be feeling curious about giving it a go. What you don't want, of course, is to come off looking like a slave to trends, or an extra who wandered off the set of Stranger Things. The simplest way to wear now is by choosing pieces at the intersection between athleisure and the utility trend. The boiler suit is spring's must-have high-street hit, and it's an obvious choice: rendered in acid-wash denim, the result is a laid-back and playful all-in-one that you can throw on easily with a pair of trainers and a cross body bag - ideally in a contrasting pastel for a subtle hit of colour - or dress up with some slinky sandals and dangling crystal earrings. Celine Dion illustrates how well denim can lend itself to partywear. While the paperbag-style trousers are best left to the pros, a pair of acid wash jeans will offer a very 2019 substitute for your usual night-out skinnies. New Look and Topshop have a range of slim and straight leg jeans in a variety of light, mid and dark acid washes, and all you need is a bit of glitz, whether it's a sparkling jacket like Celine's or some metallic pumps and earrings with a plain black top, to make it pop. For daytime, look to model Liya Kebede for a lesson in understated contrasts. Her Proenza Schouler outfit has an easy, menswear-inspired feel that makes for appealing casual wear. The pastel hues and flash of silver set off the edgy fabric, while the shape of the trousers and accessories ensure the look is fresh, contemporary and far from 80s nostalgia.